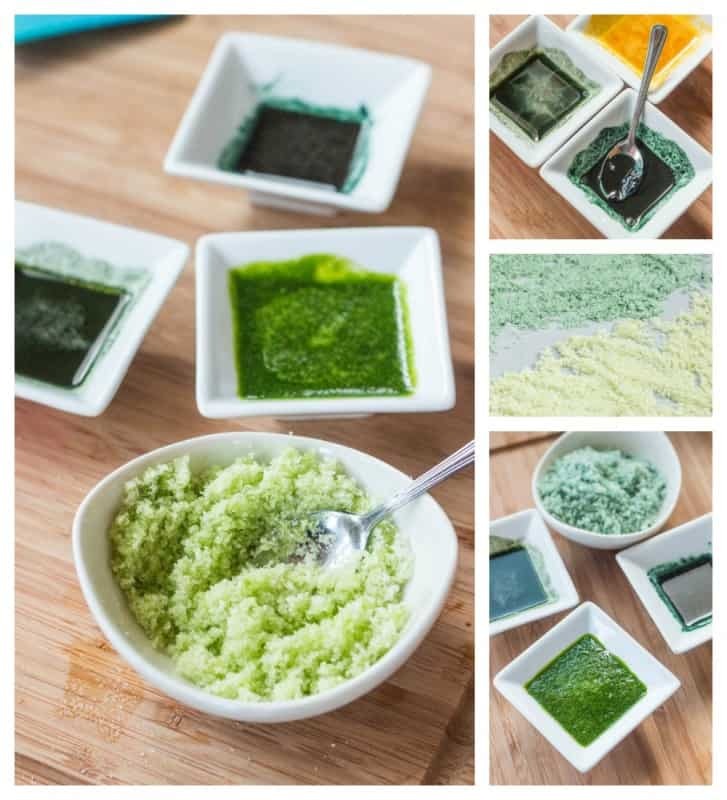 DIY Natural Food Coloring and Homemade Colored Sugar Crystals - Oh, The Things We'll Make! This week, the cold, rainy weather kept me indoors, so I was on a mission to try to replicate an American Easter treat for you. 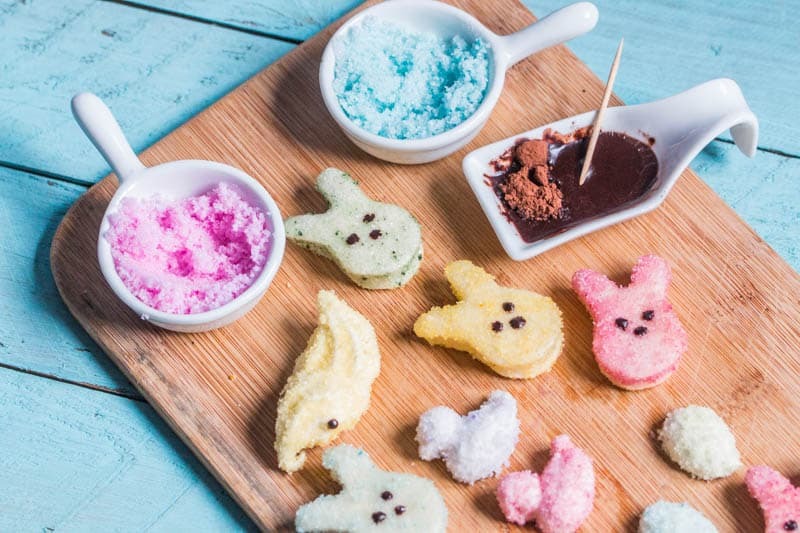 I decided to make some naturally colored, naturally flavored marshmallow peeps, which I'll be sharing with you soon, but first I'd like to show you how I ended up making my homemade colored sprinkles for covering them. The process started with me coming up with a way to make some DIY natural food coloring. I have seen posts about making DIY natural food coloring in the past, and I tried one method, a long time ago, that involved boiling spinach in water and evaporating the water away to get a concentrated solution. Unfortunately, I wasted a huge amount of spinach leaves and didn't end up with anything usable in the end! I love the way that fresh spinach blends into smoothies and other foods, turing them a beautiful shade of green. That's why I used fresh spinach in my real food shamrock shake to make it green. Seeing as it does such a good job of coloring smoothies and ice creams, I was pretty sure that spinach had enough pigment to be able to use in a DIY natural food coloring, despite being a huge failure in the boiled water attempt. I decided that the best way to use spinach is raw. When boiled, the color changes, and the water doesn't really seem to absorb much of the color. Another thing I like to make is homemade liqueurs and extracts like vanilla extract. When making them, the alcohol base tends to absorb the color of whatever it is you are trying to extract. In the case of vanilla, bakers know that adding a small amount of real vanilla extract into their white treats will end up turning them beige or light brown. Because my goal was to make colored sugar crystals, I didn't want to have to use a lot of liquid, and wanted a pretty highly concentrated pigment. So, I decided to try to make a colored extract of sorts, using alcohol with my pigments so that it would more easily evaporate from my sugar crystals quickly. All I did was mix in a small amount of vodka into a small amount of beet root powder, and used the mixture right away. Yes, I could have let it sit for an hour or two and strained it, but I was so excited to try it out. Instead, I just stirred a bit of the mixture into a bit of white sugar (Don't let the real food police know I used white sugar this time! ), and was happy to see that my sugar crystals became a beautiful hue of pastel pink! To dry out your sugar crystals, just spread them out on a baking sheet. You can let them air dry, but since it was pouring outside, and the humidity was near 100%, I chose to put them in the oven with only the fan and light on; they were dry in about an hour. During the drying process, you'll usually end up with a bit of clumping. That is OK and normal! 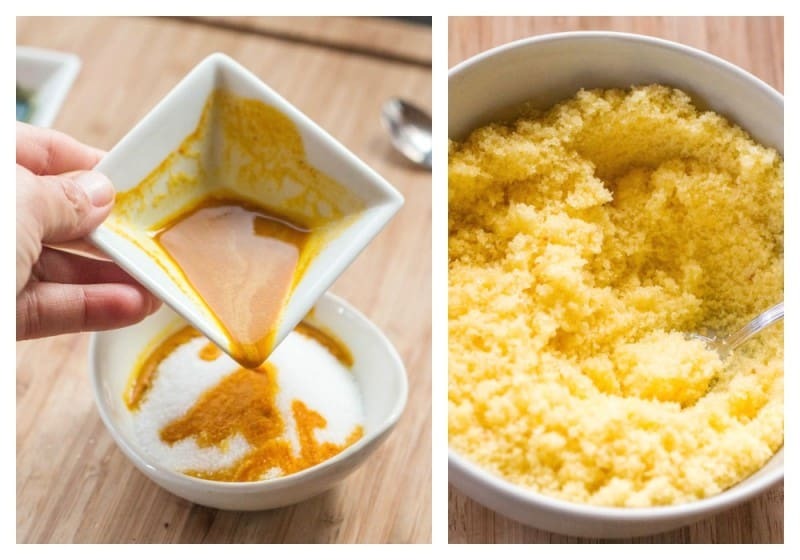 Just break up the pieces with your fingers or press on them with your spatula, and they should easily separate into perfectly dyed sugar crystals again. Store them in an air-tight container until you are ready to use them. Once I had my pink sugar crystals ready, I decided to try for a few more colors. Most marshmallow peeps are either pink or yellow, or at least they used to be, so I tried using turmeric for yellow next! I followed the same process, and was having so much fun that I decided to try for green. At first I used the first green powder I could think of, chlorella, but the resulting green didn't strike me as particularly pretty, so I mixed up a batch with spirulina powder instead. The spirulina green sugar turned out OK and resulted in a pretty bluish-green, but I should have strained the spirulina powder out of that particular batch because my resulting sugar ended up being a bit splotchy. I couldn't help but think about my spinach leaves, wanting to give them another try, so I decided to use them raw this time. Making green with chlorella, spirulina, and fresh spinach leaves. The spinach leaves made a light, yellow green color, and the spirulina resulted in more of a blueish green. I didn't use the chlorella in the end. To use them, I mixed a few leaves with a little bit of vodka, just enough to be able to blend everything together. The resulting mixture turned my sugar crystals into a light shade of spring green. Beautiful! 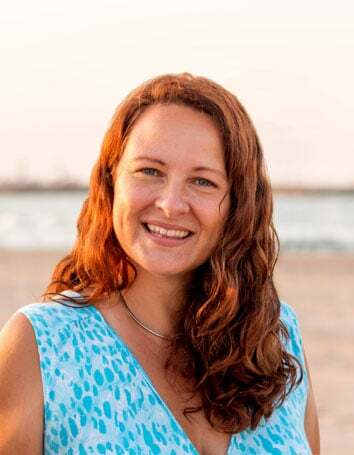 I didn't stop there, but I ended this post here because my next discovery was so super-duper crazy cool that I thought it warranted having a post to itself! I'll work on it and try to get it to you tomorrow! If you want to know how I made the purple, turquoise and light pink sprinkles, check out my post about my magical, natural color changing food coloring! Hi! Doesn’t this alter the flavor of the sugar? Yes, it does slightly alter the flavor of the sugar, but I didn’t think it was that noticeable, or at least wasn’t unpleasant. I actually haven’t used sugar since I made these the first time because the sugar didn’t hold up well when I covered the marshmallows in it, and I found that I liked coloring coconut for decorating a lot more. The coconut absorbs a lot of color, so you don’t need a lot to get the colors vibrant. You need a bit more when using sugar, but I don’t remember the flavors being overpowering. Beets gave the most pleasant flavor as they are sweet to begin with, and didn’t really add much of an unusual flavor to anything. Turmeric has a strong flavor, but it also has a very bright color. You can notice a slight turmeric flavor, but I also made everything really vibrant because I wanted bright yellow peeps. You could always do a bit of a test batch, and use less if the flavor bothers you. When I made the color changing coloring using red cabbage, I used an anise flavored liqueur, and in that case both the sugar and coconut tasted a bit like anise, so I’m not sure if the cabbage adds much flavor or not. That could be an option, though, if you are concerned about the flavor, you can use a (colorless) liqueur with a flavor you like to mask any flavor from the coloring agents. This is exactly what I have been looking for! Thank you! They really worked out much better than I expected because most of the other natural food coloring posts I had seen didn’t give a lot of color at all. I think the key to using spinach is using it raw- and it’s always best if you can get as much moisture out as you can. The alcohol really seems to help. I’m so sorry this response is so late. I was going through old messages and somehow yours ended up with the spam! I found it when clearing out the old spam messages. I didn’t really measure out any of the ingredients. I found that in the end with the leaf type colorants like cabbage and spinach, they worked best when the leaves were dehydrated and ground into a powder. I usually just take a couple of leaves, dry them, grind them into a powder, and add enough alcohol to just cover all of the powder. To actually color the sugar, I added in the colored alcohol little by little until I got the tone I liked. You don’t really need very much. Love this! But can I use water to mix with the powders instead of vodka? I don’t have any on hand and I need the sugar asap. Let me know, thanks! The reason I used an alcohol was because alcohol evaporates quickly. 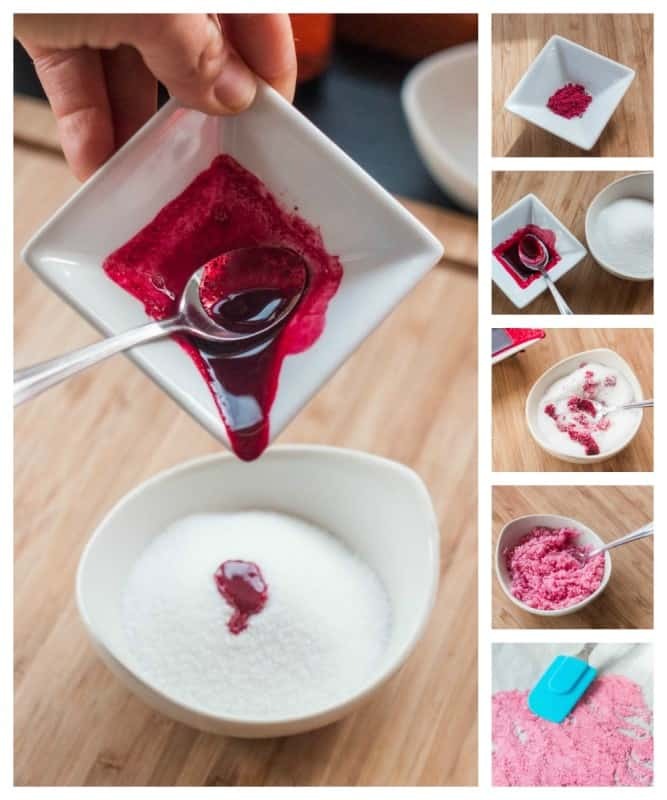 With natural dyes the concentration isn’t quite as strong as artificial dyes and it might be hard to get bright colors without dissolving the sugar crystals. That said, yes, you should be able to use water. Just try to make the liquid as concentrated as possible and add in a little at a time so as not to dissolve the sugar. You want to color the crystals, but keep them as intact as possible. Your sugar hearts turned out lovely. Yes, I chose to use alcohol for 2 reasons. One, so that it would evaporate more quickly, and that would keep the sugar crystals from dissolving. Obviously, you didn’t have that problem. The other reason I chose to use alcohol was so that the color extraction would keep longer. I was able to keep the colors for at least several days without problems. Of course, directly juicing the different plants/vegetables, etc. is a great way to get an intense color too.